Danburys Victoria Eanniello has possession of the ball while Staples Caitlin Hoberman follows close behind during a game at Danbury on Tuesday May, 20 2014. Nicki Najarian and Jenna McNicholas each scored four times as Staples doubled up Danbury 16-8 on Tuesday's Senior Night at Danbury High School. The loss snapped the Hatters' six game winning streak in the regular season finale for both teams. Leading 6-4 at the break, Staples (9-5) exploded for eight consecutive goals to start the second half. Meredith Hood scored 13 seconds into the half after McNicholas won the opening draw. The Wreckers poured it on with five goals in a 3:40 span to put the game away. "We've spent a lot of time working on our shooting," Staples coach Pete Najarian said. "We've had some games this year where our shooting percentage was terrible. We were shooting better today and you can be hard to beat when you do that." McNicholas won most of the draws during the stretch and added a pair of goals 10 seconds apart to push the lead to 11-4. 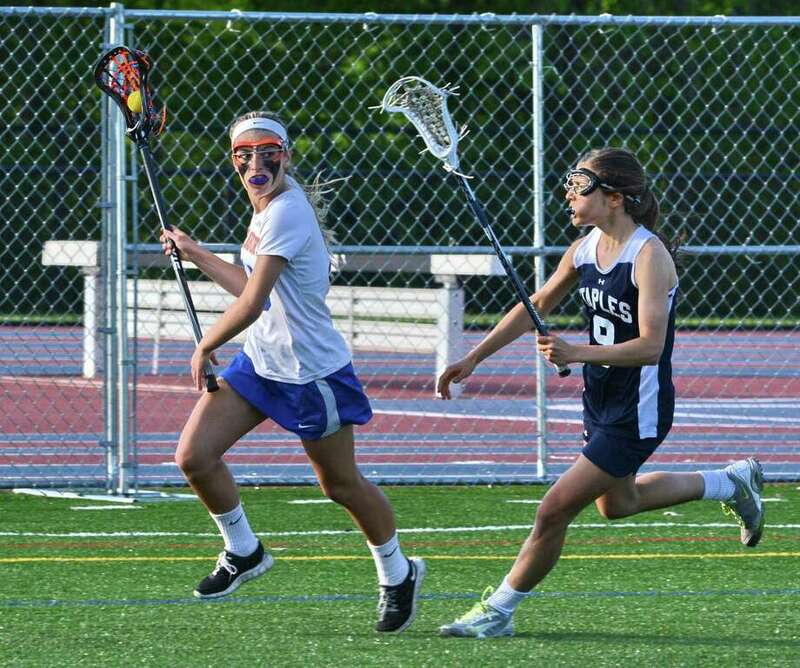 "(McNicholas) was a beast and she did very well," Danbury midfielder Lindsey Eanniello said. "I just think we need to be hungrier for it. We were getting in there; it was just tough with the ground balls." Najarian also scored twice during the stretch and dished out two assists. The Wreckers, led primarily by juniors, have scored 55 goals in their last three games. "I just kept my head clear and had a lot of faith in my teammates," Nicki Najarian said. "I knew whenever I passed the ball, they would be right there catching it and making smart decisions. As a team we did really well." Danbury (9-7) controlled most of the opening half and would have entered the break in front if not for a disparity in shooting percentage. The Wreckers scored on all six of their shots in the first half while Danbury was held at bay by Staples goalie Emma Boland. Boland made nine saves in front of a defense that helped contain the Hatters' top threats. "Emma did a fantastic job of adjusting to how their attackers were shooting the ball," Pete Najarian said. "Our defense got smarter about body position versus stick checks. The slides came early and I think that really helped." Eanniello scored three goals for Danbury, while Najmah James added a goal and an assist. The Hatters scored four of the game's final six goals once the draws evened out. Both teams will now turn their attention to the FCIAC playoffs, which are set to begin Friday. The seeds are voted on by the coaches after the teams with the best eight records are determined. The Wreckers drew Greenwich and Danbury will travel to Wilton. "I think we are ready to go up against any team," Staples defender Amelia Heisler said. "Aside from Darien (a 19-7 loss), we were close with Wilton and New Canaan (10-5 and 10-9 losses), and we were really happy about the Greenwich (17-15) win. Ultimately we are ready for any challenge and we are excited for the FCIAC tournament and we hope to go far." The Hatters won their first ever FCIAC playoff game a year ago against the Warriors. "We've gone through adversity this whole season," James said. "This is just another hurdle that we went through and we're going to come back even stronger for FCIACs and states."